One is Irish. The other has strong Irish connections. And that’s where the similarities end. Stylistically P.W. Bridgman and George McWhirter are oceans apart but both tap into a rich vein of poetic creativity. 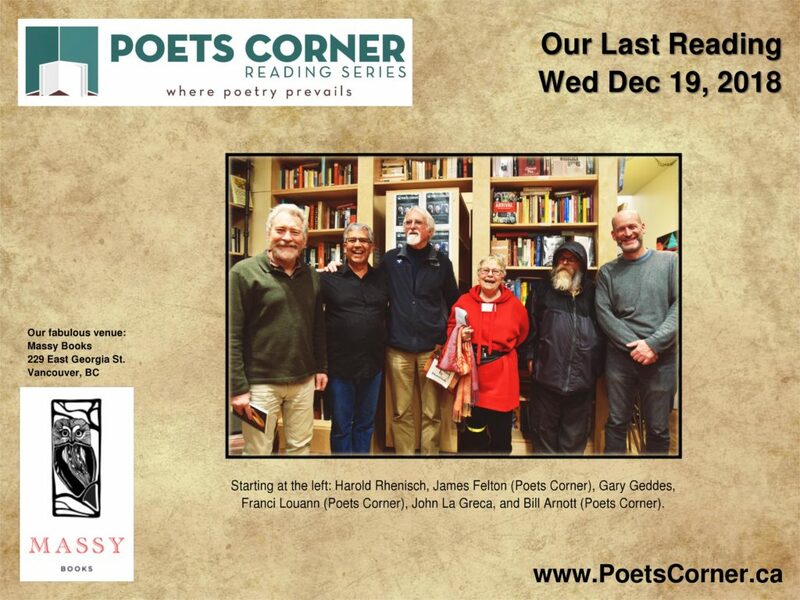 Good friends who are also great poets made for an enjoyable evening at the March reading at Poets Corner. 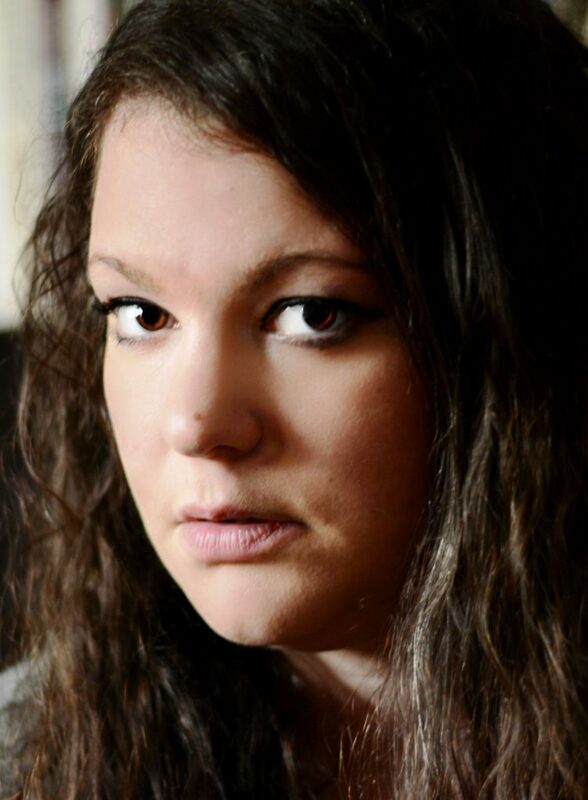 Chelsea Comeau is a freelance writer and editor whose work has appeared in Freefall, CV2, and Room magazine, and is forthcoming in Prairie Fire. In 2018, she received an Honourable Mention in both the CV2 Two-Day Poem Contest and the CV2 Young Buck Poetry Prize. She is currently the poetry editor at WordWorks magazine. Our full Open Mic segment is back for this reading! Please arrive at least 15 minutes before we get underway to ensure you land a spot on the list. We will be starting at 7pm sharp on Wednesday, April 17. Looking forward to seeing you! And yes, another blockbuster reading! Last Wednesday, February 20 we had the pleasure of hearing not one, not two, but three(!) fabulous poets. 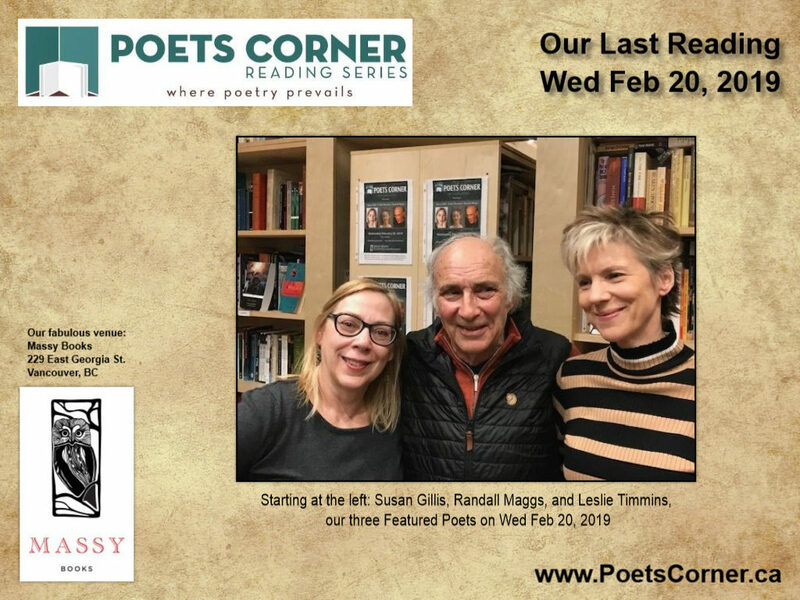 Susan Gillis and Randall Maggs swung in from the icy east and, joined by local poet Leslie Timmins, gave one of our most eclectic and electric readings. 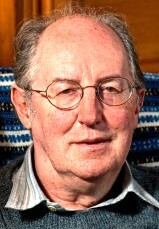 George McWhirter is transatlantically anthologized in The Penguin Book of Canadia Verse and Irish Writing in the Twentieth Century (Cork University Press). Most recent books of poetry are The Incorrection (Oolichan Books) and The Anachronicles (Ronsdale Press). 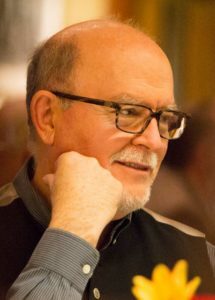 His story collection, The Gift of Women, appeared from Exile Editions in 2014. He served as Vancouver’s inaugural Poet Laureate and edited A Verse Map of Vancouver with photographs by Derek Von Essen for Anvil Press. Lately, his poem “On a Globe Maple” appeared in the League of Canadian Poets’ 2018 Anthology, Heartwood; the poem “Reef” appeared in CLI-FI, Canadian Tales of Climate Change, Exile Editions, 2017. P.W. 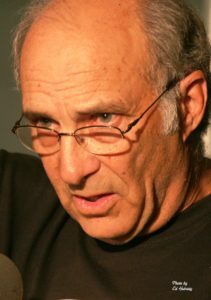 Bridgman’s first book of poems, entitled A Lamb, was published in September 2018 by Ekstasis Editions. A selection of short stories entitled Standing at an Angle to My Age, published by Libros Libertad, preceded it in 2013. 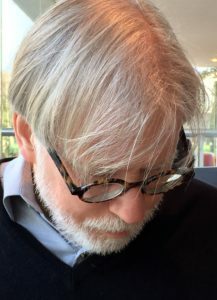 Bridgman’s writing has appeared in, among other outlets, Grain Magazine, The Moth Magazine, The Antigonish Review, The Honest Ulsterman, The Galway Review and The Glasgow Review of Books. He was a participant in the writing summer school program offered by the Seamus Heaney Centre for Poetry at Queen’s University, Belfast in July 2018 and describes that as one of the most formative experiences of his writing life. Our full Open Mic segment is back for this reading! Please arrive at least 15 minutes before we get underway to ensure you land a spot on the list. We will be starting at 7pm sharp on Wednesday, March 20. Looking forward to seeing you! Wow! What a reading we had in December! You’d think six days before Christmas would mean a lean turnout. Well, we had a standing-room-only crowd who were enthralled by one of our most captivating readings to date. With three featured poets (and an abbreviated Open Mic segment squeezed in as well), the feedback has been one of the most enthusiastic we’ve received in recent memory. Gary Geddes, Harold Rhenisch, and John La Greca delivered a myriad of styles, subjects, and emotional one-two’s like we’ve never witnessed in quite a long time. 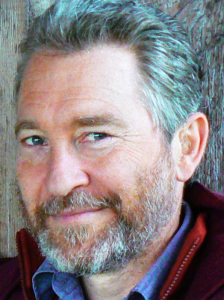 Gunargie O’Sullivan is a Kwakwaka’wakw who was born in Alert Bay, BC. However her people originate from Turnour Island and are from the Tlowitsis Nation, a proud and powerful people. 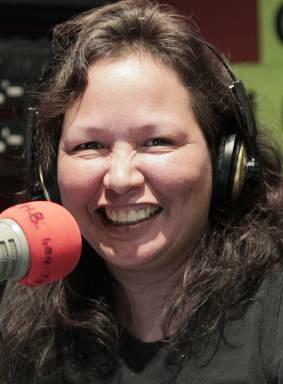 She has a long history as a radio broadcaster who has developed community programming that closes awareness gaps on everything from fish farms, to Missing and Murdered Women, to tiny house warriors, to Residential Schools, to Sixties Scoop, and to the poop on politics. 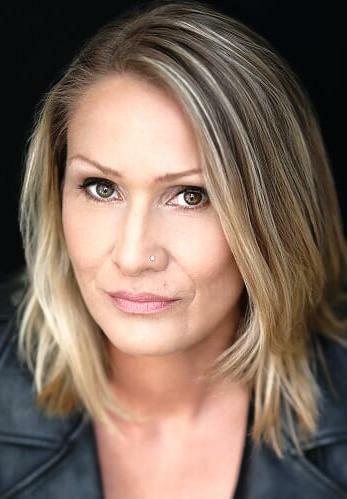 She is also a multimedia artist who first explored acting at sixteen before joining the Spirit Song Native Theatre in the mid-80s. After discovering her writing skills several of her poems have been anthologized in the annual series, Gatherings, published by Theytus Publishing. She later began to explore journalism and film. She has produced several short films such as UNsettling, Power of Prayer, and most recently , Demolishing Grief. Ms. O’Sullivan is also the Founder and now Acting Executive Director of the Red Jam Slam Society, which exists to initiate celebrations, events and festivals that feature Aboriginal artists and performers. Tawahum Bige, Lutselk’e Dene and Plains Cree, Two-Spirit and Nonbinary poet, resides on unceded Musqueam, Tsleil-Waututh and Squamish territory colonially-known-as Vancouver. 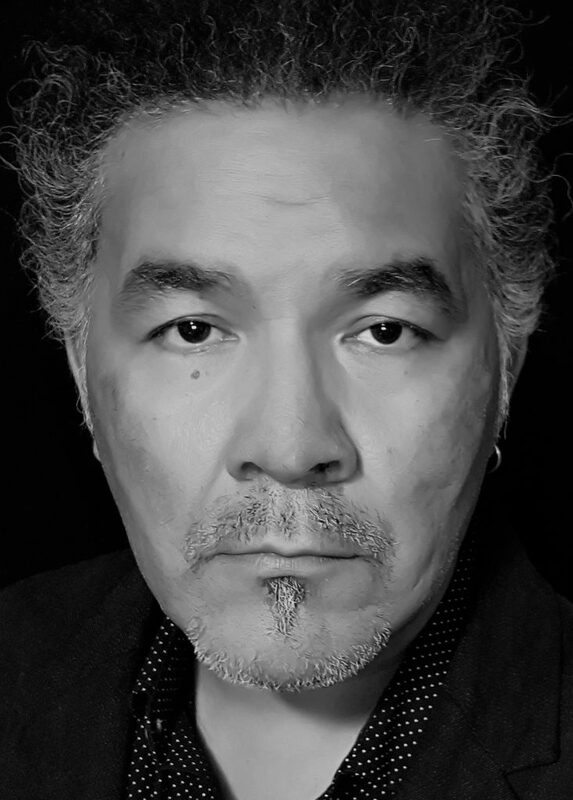 Published in Red Rising, Prairie Fire, Event, and Poetry is Dead magazines, Tawahum’s poetry stokes the sacred fire of resurgence and decolonization on occupied Turtle Island. They’ve performed on stages including Talking Stick Festival and Verses Festival of Words. 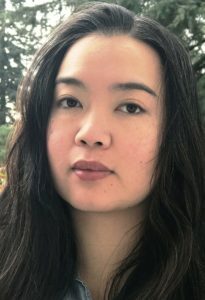 In their final year toward a BA in Creative Writing at KPU, Tawahum’s poetry collection, Political & Personal, will be published in June 2019 with Metatron Press. Join them on this journey that is both emotionally personal and deeply political. 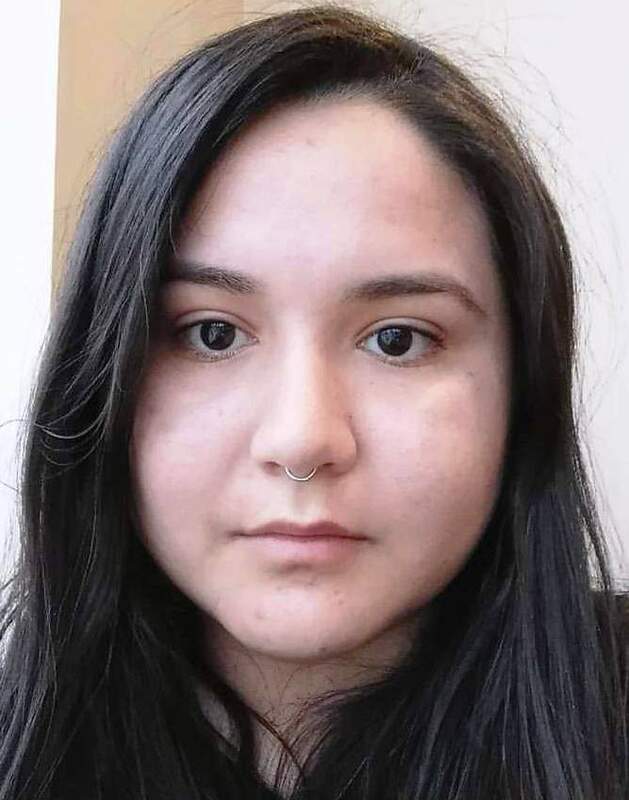 Brandi Bird is a Two-Spirit Saulteaux and Cree poet from Winnipeg, Manitoba, currently living and learning on Musqueam, Squamish and Tsleil-Waututh territory. She has been published in Poetry Is Dead and Pearls, and will be published in Prism early this year. You can find her on Facebook as Brandi-Ann Oiseau. These Aboriginal writers are going to blow you away with their poetic talents. 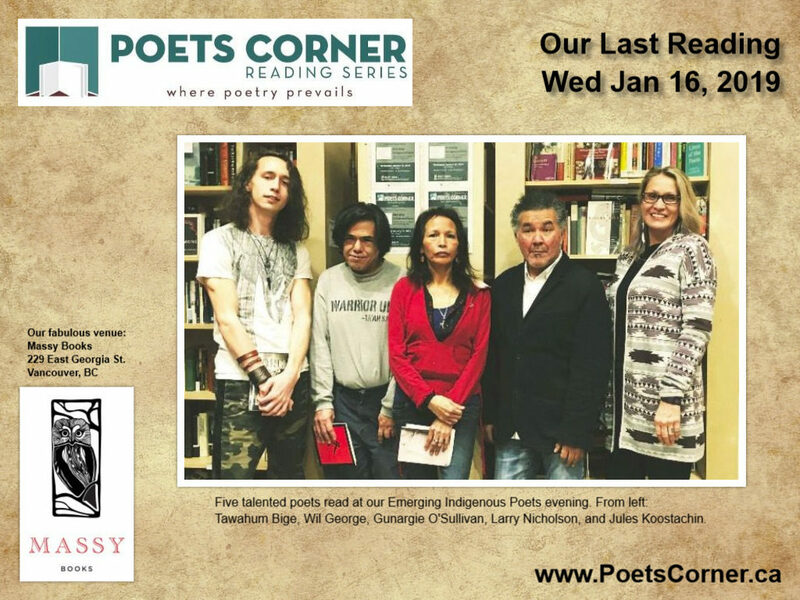 Make sure you get a seat early for this reading on Wednesday, January 16 at 7:00pm. It’s happened. Poets Corner has just hosted our first ever Open Mic Contest. What an exciting evening it was and what a close final result. Thanks to the Canada Council, we were able to make our inaugural Open Mic contest a little more attractive with some cash prizes as well as bragging rights at stake. Three Honourable Mentions went to Ted Lederer, Clayton Stephens, and Lilija Valis who each received $25. Second prize of $50 went to Jacquie Pearce, and first place honours went to Fran Bourassa who walked away with a cool $100 in cash. It was incredibly close in the voting and there were some stellar poems topped by even more stellar deliveries. Yes, we are having a reading in December! We can’t think of a better way to de-stress from the Holiday Season than by listening to some fine, fine poets and poetry. We have three featured poets stepping up to the microphone on December 19! All three are out-of-towners, so let’s welcome them and show our appreciation for their efforts to get here during a busy time of the year. 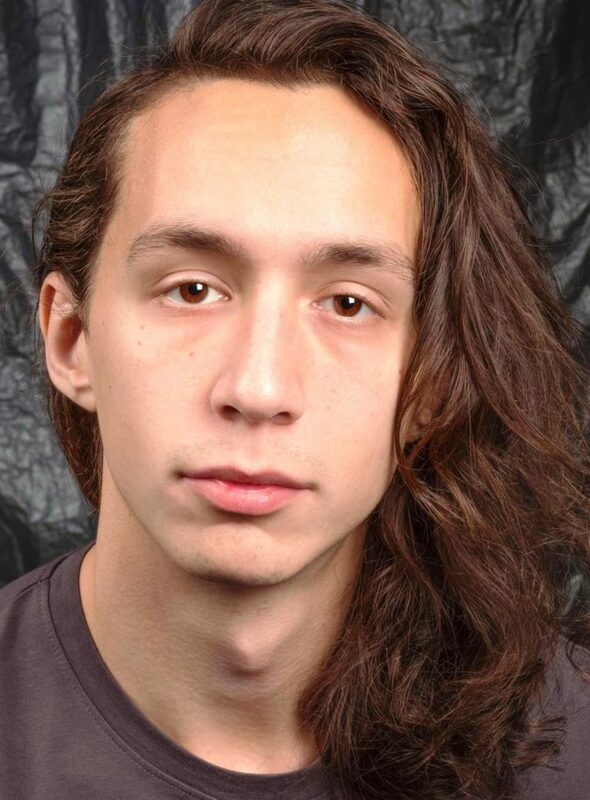 We have to poet stalwarts and we’re introducing someone relatively new to the reading scene. Take a look at who’s coming and read their bio’s, here. Yes, a very exciting poetry contest is coming up in November, but before giving you the low-down, let’s not forget what a fantastic reading we had this month. Receiver, and the evening ended with her reading a poem inspired (very tongue-in-cheek, mind you) by leafing through People magazine that she had then sent to Penn, followed by Penn stepping up to the mic and reading her poetic response. A wonderful evening, all round. November’s reading won’t be a reading at all. Instead, it’s a contest. 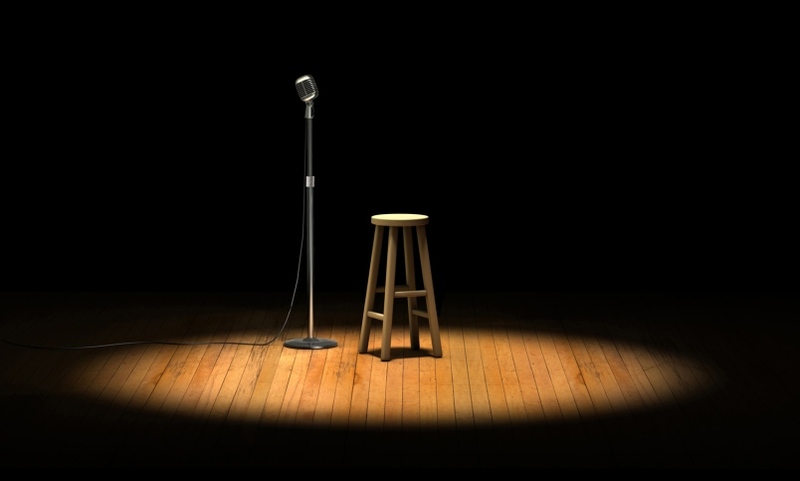 Our very first Open Mic contest is taking place on Wednesday, November 21. It’s simple. Read one of your finest poems and you could win the top prize of $100 cash. There is a total of $225 in prizes ($50 for second and three runners-up prizes of $25 each). Your poem can be published or unpublished but you are restricted to just one. You will have a maximum of two minutes to deliver your potential prizewinning poem. And who decides on the winners? The audience does. Everyone in attendance will be given a ballot to vote on each contestant. Those with the most votes win. It’s simple; it’s fair, and it’s going to be a whole heap of fun. There won’t be any featured poets for November’s reading, just you with with what you consider to be your best effort to win our inaugural Open Mic Contest. Doors open at 6:40pm. To get through the evening in our allotted time, we will have to cut off participants at some point. The sooner you get there, the better your chances of getting into the lineup. 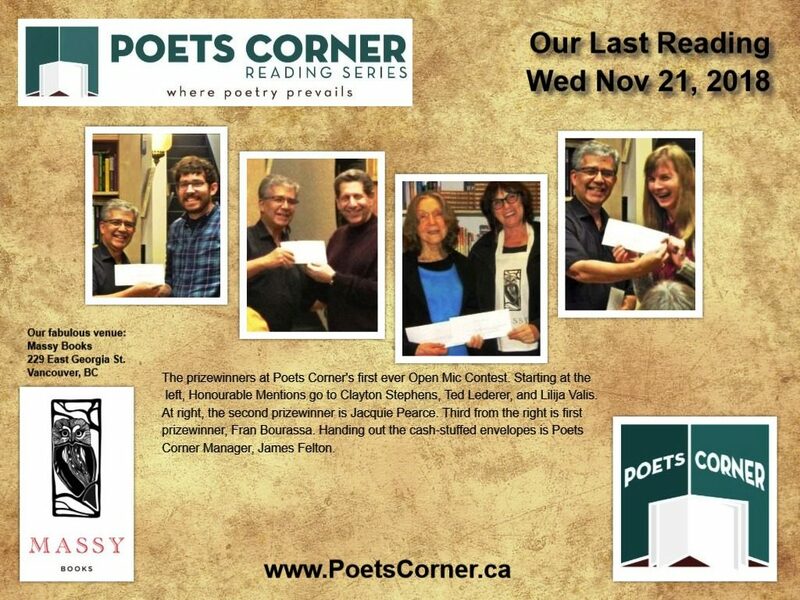 See you all at November’s Poets Corner reading on Wednesday, November 21. We’re underway at 7:00 p.m. sharp (and don’t forget your poem)! Before telling you about next month’s poetry reading, a little more about this month’s event that took place on Wednesday, September 19 at our wonderful host venue, Massy Books. We had an exceptionally talented duo who once shared a life as teacher and student. Onjana Yawnghwe was a graduate student at UBC in the class of esteemed scholar, writer, and professor, William New. 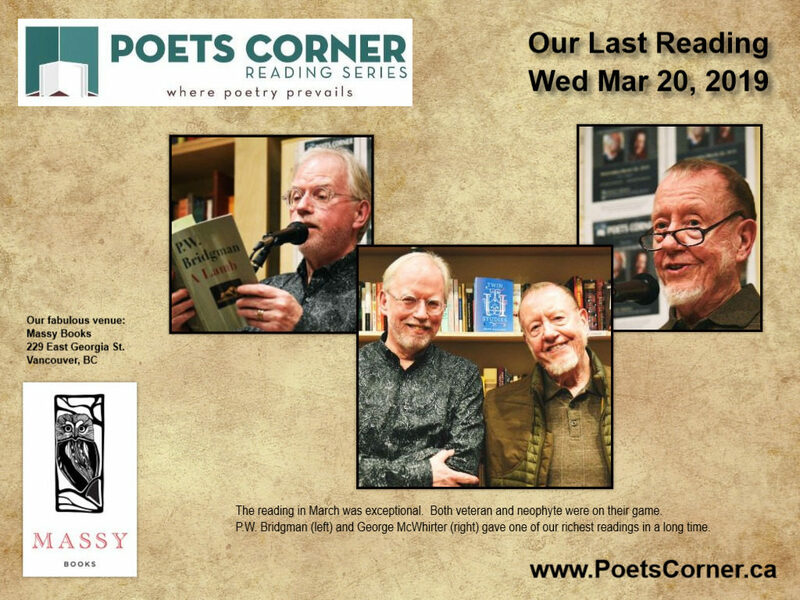 Poets Corner brought them together once again and they gave us a reading to remember. Onjana read from her just-released The Small Way, a touching and at times heart-wrenching volume dealing with a life partner who is transitioning. And Bill read from his recent volume Neighbours, taking us on a journey of emotions from sombre reflection to light-hearted banter. Penn Kemp, poet, performer and playwright, has been celebrated as a trailblazer since her first publication of poetry by Coach House Press in 1972. A “one-woman literary industry”, she was London’s inaugural Poet Laureate and Western University’s Writer-in-Residence. The League of Canadian Poets’ 2015 Spoken Word Artist, Kemp is a keen participant in Canada’s cultural life with multimedia releases and thirty books of poetry, prose and drama to her name. New poetry books are Fox Haunts (Aeolus House) and Local Heroes (Insomniac). Find out more at www.pennkemp.weebly.com. Her latest collaboration is up on https:/riverrevery.ca. 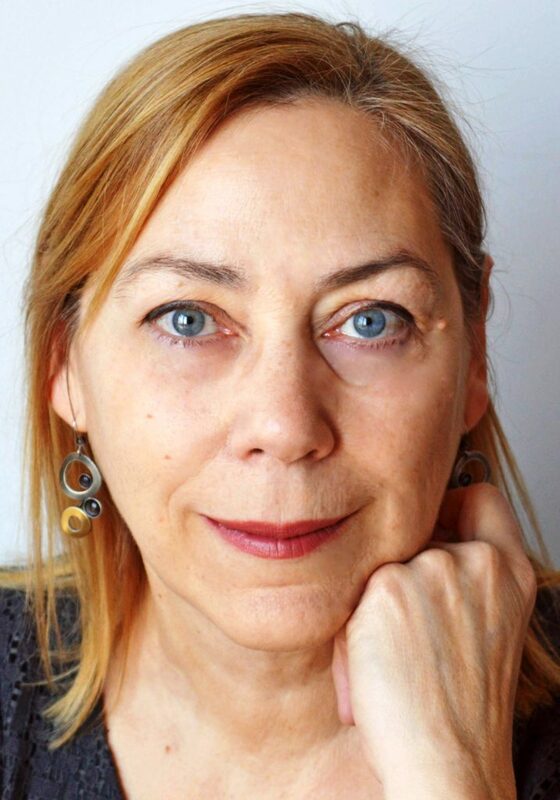 Sharon Thesen is a BC-based poet, editor, critic, and professor who has published nine books of poetry, most recently The Good Bacteria (2009) and Oyama Pink Shale (2011) with House of Anansi Press, and The Receiver (2017), with New Star Books. 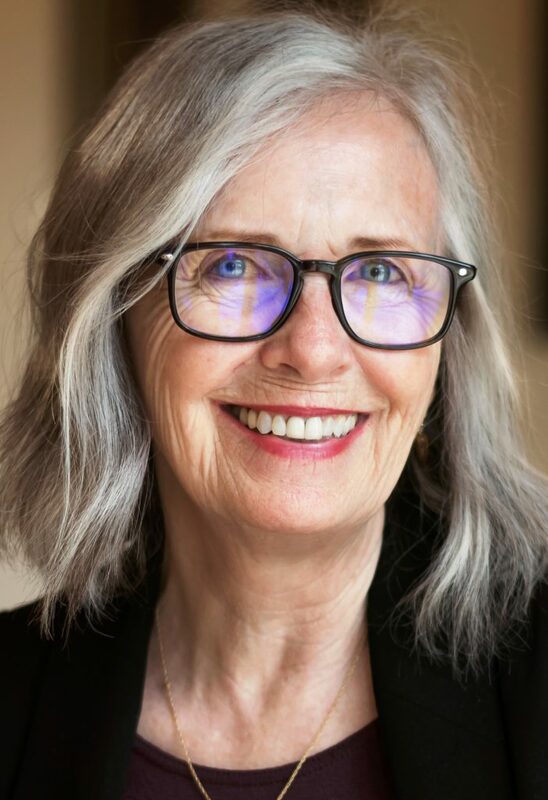 She has also edited two editions of The New Long Poem Anthology and has been an editor of The Capilano Review and co-editor of Lake: A Journal of Arts and Environment. A winner of the Pat Lowther Award, she has also been a three-time finalist for the Governor-General’s Award and twice a finalist for the Dorothy Livesay Poetry Award. 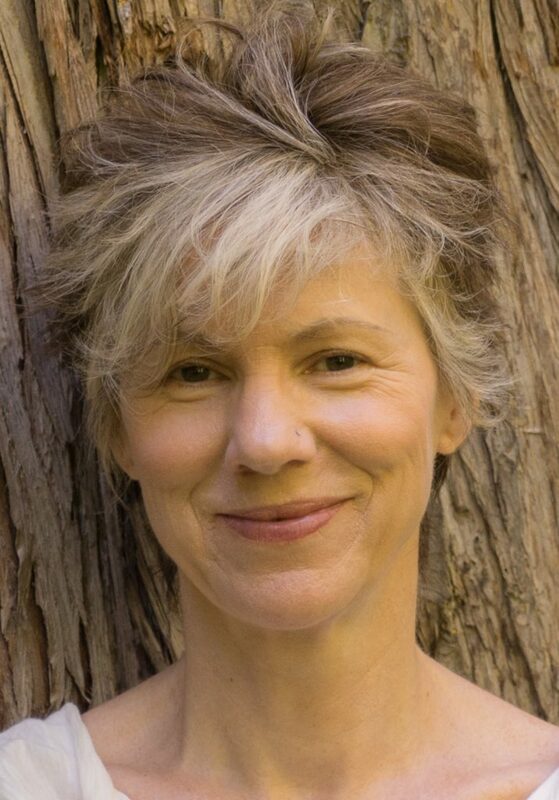 Sharon currently writes journalistic essays on poetry and poetics and teaches poetry workshops in Lake Country, where she lives in the north Okanagan. There will be an Open Mic segment for this reading, so if you want a chance to deliver one of your best poems, get there early. Doors open at 6:40pm. 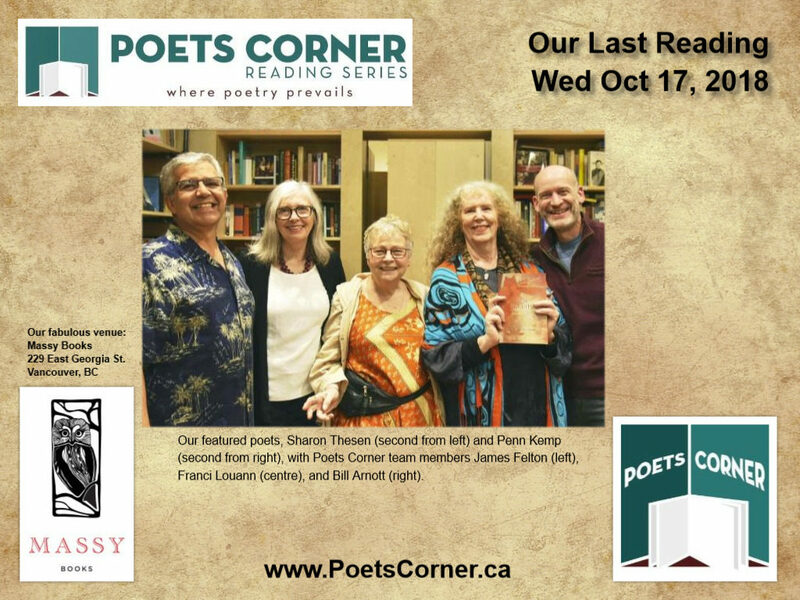 See you all at October’s Poets Corner reading on Wednesday, October 17. We’re underway at 7:00 p.m. sharp. Fall is on its way, or so it seems. And up until now we’ve handled it all: searing heat, threatening wildfires and smoke-filled skies. Surely we can handle some sizzling poetry too. Onjana Yawnghwe is Shan-Canadian and was born in Thailand but grew up in B.C. She is the author of the poetry books Fragments, Desire (Oolichan, 2017), and the forthcoming The Small Way (Caitlin Press, Fall 2018). She was nominated for the Dorothy Livesay Poetry Prize and longlisted for the Gerald Lampert Award in 2018. She has an MA in English and currently works as a nurse in Vancouver. Starting this month, our reading series kicks off at 7:00 p.m., a half-hour earlier than before. Yes, we will have the Open Mic segment for this reading, so if you want a chance to deliver one of your best poems, get there early. Doors open at 6:40pm. 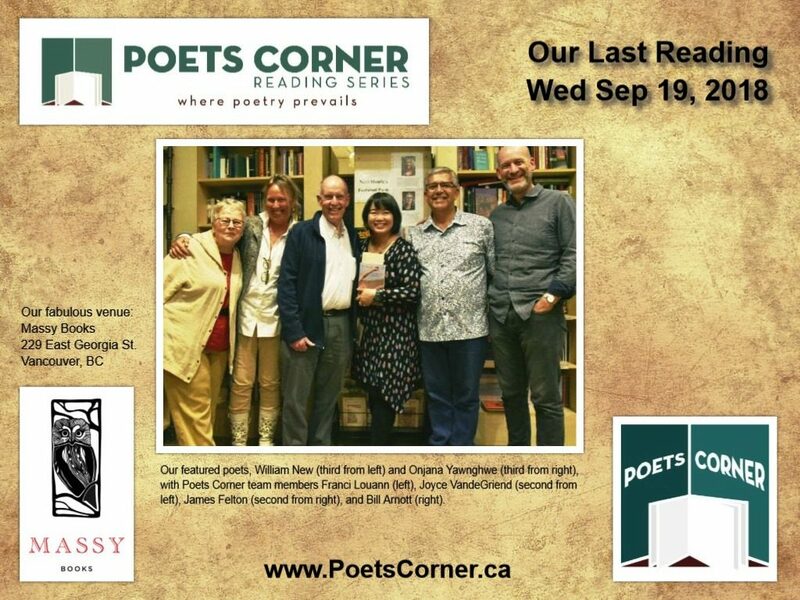 See you all at this month’s Poets Corner reading on Wednesday, September 19. We’re underway at 7:00 p.m. sharp. Before sharing about this month’s fabulous reading, this is a reminder we are taking a summer break, so there will not be a reading in August. Simply put, July’s reading was mesmerizing. One poet held us captive for the entire time we were together. After a lengthy absence from Vancouver (after all, she lives in Denmark! ), Heather Spears charmed, joked and left us reeling with emotional upheaval. This is someone who will always have a reserved spot at the mic every time she’s in town. With our recent hot weather, it’s the perfect reminder that some of us may be lying in a hammock somewhere, slowly sipping a refreshing Moscow Mule, instead of our usual monthly gathering at Massy Books. 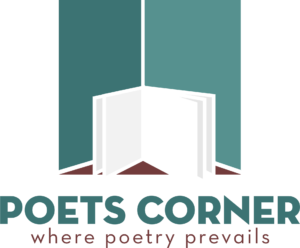 Please don’t show up on the third Wednesday of August as Poets Corner won’t be there. We will reconvene on the third Wednesday of September — that’s Wednesday September 19 at 7:30pm. We’re holding back for now on who will be reading in September. But hone a good poem or two of your own, as there will be an Open Mic segment at this reading. June’s reading brought us two very different yet very powerful readings. 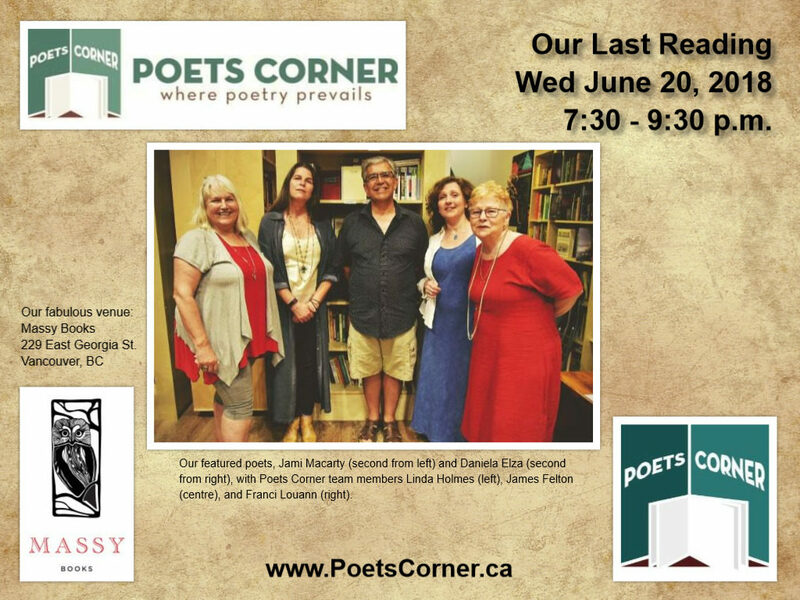 Daniela Elza (accompanied by her bassist friend, Clyde Reed) and Jami Macarty served up a compelling evening of crisp, well-wrought poems. This is the first time in a long time that we have had a musical accompaniment to a poetry reading. The verdict? It was the perfect dance of words and strings. 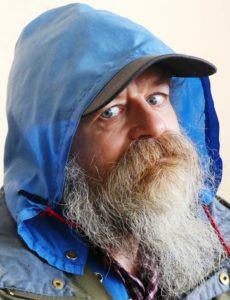 Stephen Scobie was born in Scotland, but has lived in Canada since 1965, and most recently in Victoria since 1981. 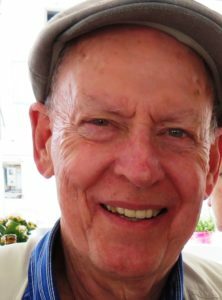 He is now happily retired after teaching stints at the University of Alberta in Edmonton as well as at the University of Victoria. 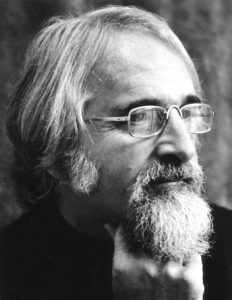 He has published over 20 volumes of poetry, including McAlmon’s Chinese Opera (Quadrant Editions, 1980) which won the Governor-General’s Award that year. 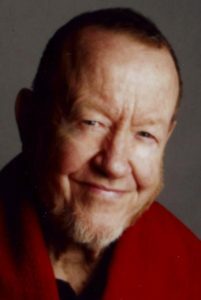 He has also had critical studies published of Bob Dylan, Leonard Cohen, bpNichol, and the Scottish poet and artist, Ian Hamilton Finlay. In 1995, Stephen was elected a Fellow of the Royal Society of Canada. 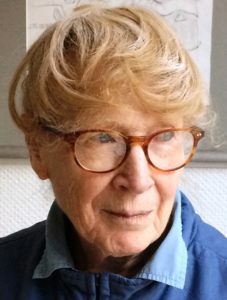 Heather Spears, Vancouver-born writer and artist, has lived in Denmark since 1962. Among her published work are 14 collections of poetry, five novels, four books of drawings, and a non-fiction work. 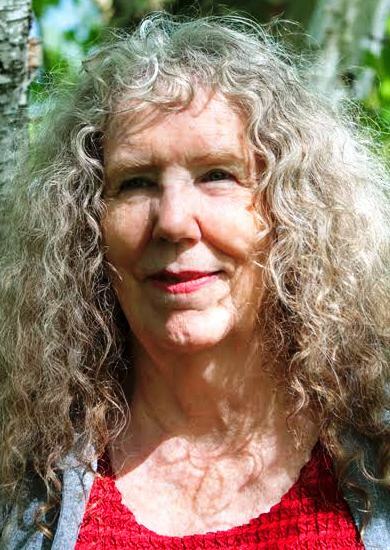 She has been the recipient of several literary awards not the least of which are a Governor-General’s Award for Poetry, three Pat Lowther Memorial Awards, and a CBC Literary Prize. A book of translations of her poems into Danish is forthcoming this year. As an artist she teaches drawing and writes about drawing and the brain (The Creative Eye: Drawing, Vision and the Brain (2012). Heather specializes in drawing premature infants and has drawn in theatres, concert halls, courtrooms, hospitals, and war zones. She has held close to 100 solo exhibitions of her work in Europe and America. Yes, we will have the Open Mic segment for this reading, so if you want a chance to deliver one of your best poems, get there early. Doors open at 7:10pm. 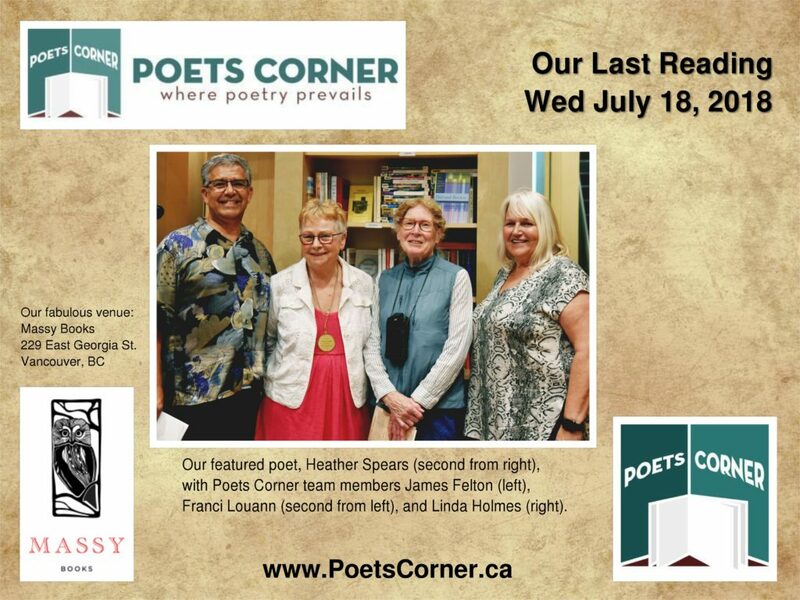 See you all at this month’s Poets Corner reading on Wednesday, July 18. We’re underway at 7:30 p.m.